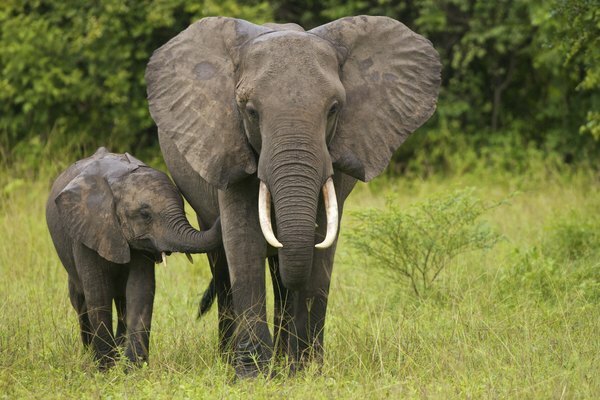 Elephants are the largest living land mammals and have two distinct species: the African and the Indian. The African has two different sub-species and the Indian has four. Most of these species have the same range of physical adaptations. Some of these unique adaptations help the elephants survive in harsh, hot climates and perform complex tasks that would usually be difficult for such a large animal. 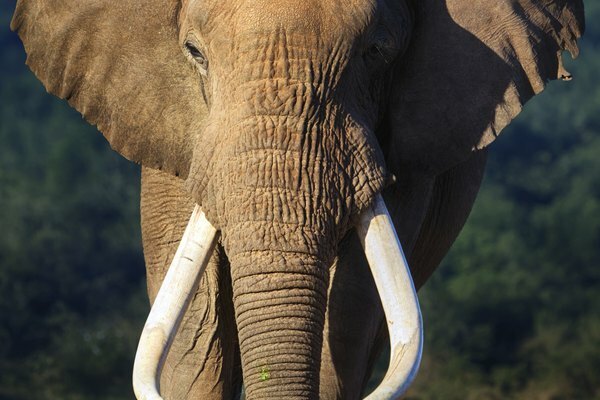 Both sexes of the African and the males of the Asian species of elephants have long teeth known as tusks. These long, curled teeth are both beneficial as well as dangerous to the animals. 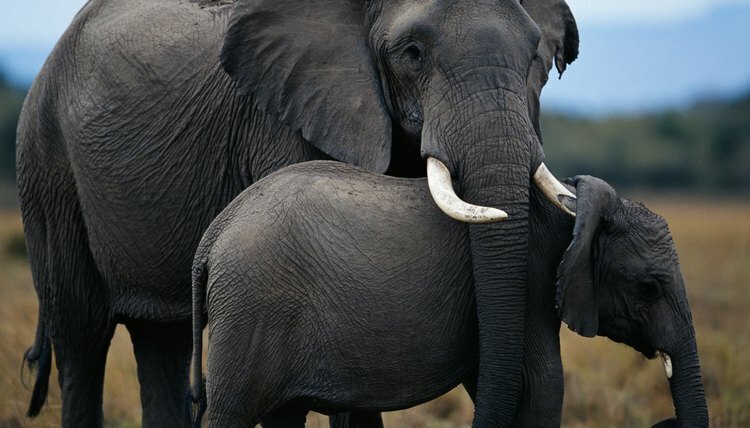 The ivory trade makes the elephant a target for poachers looking to take and sell their tusks. The elephants' uses for these long tusks include the stripping of bark from trees, digging in the dirt and as a resting place for their trunks. Tusks are also used as weapons to protect from predators or to fight with other elephants. 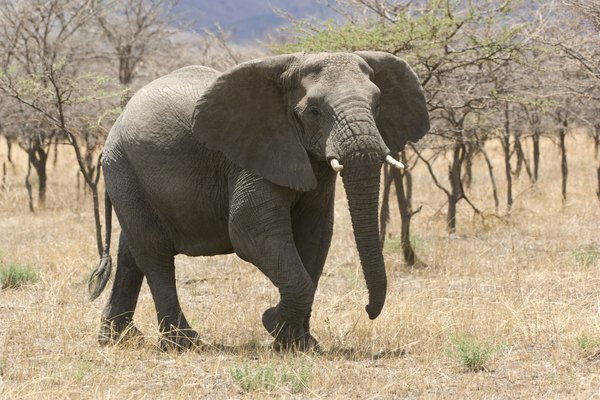 The most agile and powerful nose in the animal kingdom, an elephant's trunk is thought to have over 40,000 muscles. This long, snaking nose makes these huge animals capable of some very intricate tasks. It is used to pull branches down from trees for the elephant to eat as well as a suction device for gallons of water which is then squirted into the animal's mouth. It also finds a use as a powerful weapon against predators or a way to soothe a scared infant elephant with a gentle stroke. Larger in Africa than in India, an elephant's ears are used for a number of purposes. 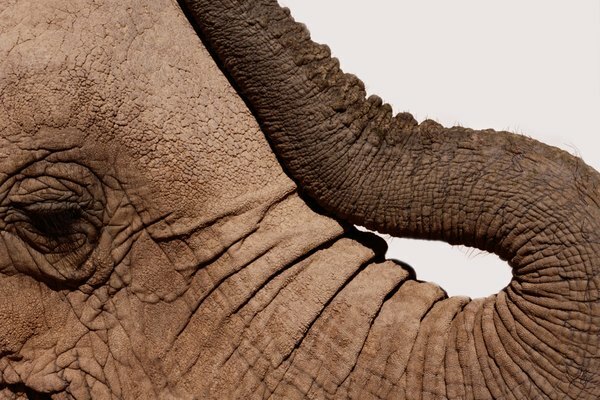 As unique as a fingerprint, no two elephants' ears are exactly the same. They are commonly used in displays of aggression; an elephant will open its ear flaps out to make their heads look larger and more imposing. The ears also make effective air conditioning. When an elephant flaps its ears, it is able to decrease its body temperature by up to 10 degrees Fahrenheit (-12 degrees Celsius) and the flapping helps to cool the blood. Known as pachyderms, which means thick skinned, an elephant's skin is not as thick as it may appear. In places it is up to 1 inch thick (2.5cm), but in other places, such as behind the ears or on the chest and stomach, it is as thin as paper. Due to the animal's size, it does not really need thick skin as a defense; the skin's main purpose is to help keep the elephant cool. The wrinkles on the skin are designed to produce more surface area through which heat can be dissipated.